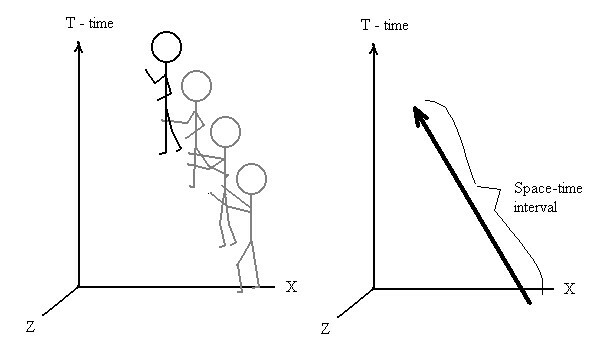 Another corollary of special relativity is that, in effect, one person’s interval of space is another person’s interval of both time and space, and one person’s interval of time is also another person’s interval of both space and time. Thus, space and time are effectively interchangeable, and fundamentally the same thing (or at least two different sides of the same coin), an effect which becomes much more noticeable at relativistic speeds approaching the speed of light. Einstein’s former mathematics professor, Hermann Minkowski, was perhaps the first to note this effect (and perhaps understood it even better than Einstein himself), and it was he who coined the phrase “space-time” to describe the interchangeability of the four dimensions. In 1908, Minkowski offered a useful analogy to help explain how four-dimensional space-time can appear differently to two observers in our normal three-dimensional space. He described two observers viewing a three-dimensional object from different angles, and noting that, for example, the length and width can appear different from the different viewpoints, due to what we call perspective, even though the object is clearly one and the same in three dimensions. The idea perhaps becomes even clearer when we consider that our picture of the Moon is actually what the Moon was like 1¼ seconds ago (the time light takes to reach the Earth from the Moon), our picture of the Sun is actually how it looked 8½ minutes ago, and by the time we see an image of Alpha Centauri, our nearest star system, it is already 4.3 years out of date. We can therefore never know what the universe is like at this very instant, and the universe is clearly not a thing that extends just in space, but in space-time. Due to the relativistic effects of time dilation, our idea of “now” is therefore something of a fictitious concept, one which we as humans have invented for ourselves, but for which nature itself has no real use. Physicists do not regard time as “passing” or “flowing” and time is not a sequence of events which happen: the past and the future are simply there, laid out as part of space-time. The "twins paradox" mentioned in the previous section can be considered an example of this: whereas the stay-at-home twin’s progress through space-time was wholly through time, the traveling twin’s progress was partly through space, so that his progress through time was less than that of the stay-at-home twin (so that he aged less). Therefore, as Einstein remarked, “For us physicists, the distinction between past, present and future is only an illusion, however persistent”, and these concepts really do not figure at all in special relativity. Similarly, our whole conception of space becomes unreliable as the relativistic effects of length contraction become apparent at high relative speeds. But the malleability and blurring of space and time also has implications for other aspects of physics. Just as Maxwell had shown that the electric and magnetic fields, once considered completely separate entities, were both just part of a single seamless entity known as the electromagnetic field, likewise (although perhaps more difficult to grasp and perhaps more unexpected) energy and mass turn out to be just different faces of the same coin, a connection encapsulated in Einstein’s justifiably famous formula, E = mc2, which we will look at in the next section.